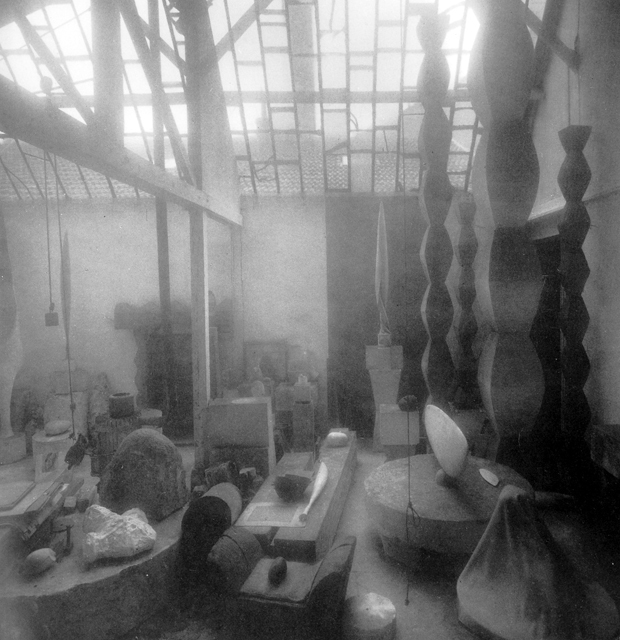 Photograph by Robert Doisneau after Brancusi’s death showing the original studio. 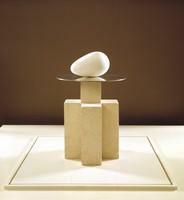 One of my favorite artist has always been Constantin Brancusi. 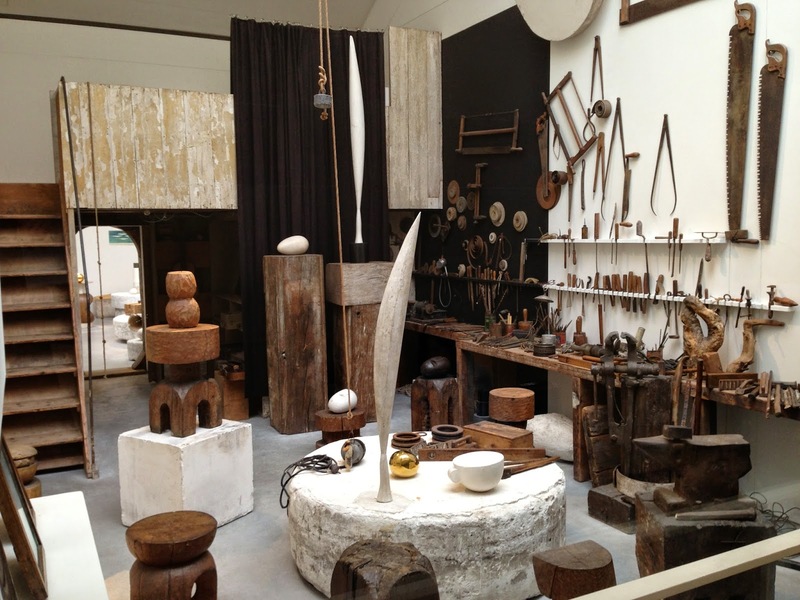 One of the highlights from our family trip to Europe when I was 18 was seeing Brancusi’s recreated studio at Musée National d’Art Moderne in Paris. It was recreated to appear as it did at Brancusi’s death, although the Musée National d’Art Moderne’s recreation seemed a bit spruced up in comparison to photographs of his studio that were taken shortly after his death. His recreated studio was later moved to the Centre Pompidou. 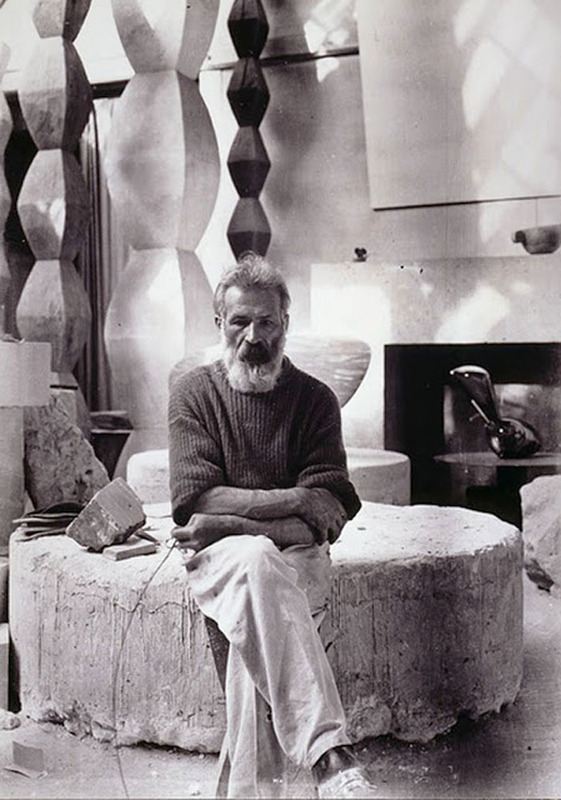 I remember all of Brancusi’s tools laying on his work bench and that reminded me of my Grandfather’s wood shop when I was a child. I also remember seeing Brancusi’s violin that was laying on a sculptural pedestal. I imagined Brancusi taking a break from his sculpting and picking up the violin and playing some old Romania’ folk song. Brancusi supposedly built the violin he played. Playing the instrument that he built, just another reason I love this artist. It is one thing to see works of art hung so pristinely in a museum or gallery and another to see works of art in a studio….some finished, some in process. Seeing an artist studio gives you a lot of insight to how an artist works and their working habits. My father, Barney Charles Delabano was the noted Curator of Installation Emeritus at the Dallas Museum of Art for thirty-three years. That gave me great access to art as a child. Up into my teens I was free to wander around unattended in the DMA’s basement and was able to go into vaults and look at art. And of course the DMA of my childhood was then named The Dallas Museum of Fine Arts and was at Fair Park by the lagoon. My friend Fred McElroy and I, while working for my father one summer even stole a bottle of really good whiskey from the “Beaux Art’s Ball” storage cage that was down in the museum’s basement. Of course this was all pre-video security systems. My mother recently recounted this wonderful story of my father and her moving Brancusi’s “Beginning of the World” from James and Lillian Clark’s house to the Dallas Museum of Art. Constantin Brancusi, “Beginning Of The World”, c. 1920, 30 x 20 x 20 in. Marble, nickel silver, and stone, collection of the Dallas Museum of Art. “The Clark’s would go to Switzerland in the summer, and when they did, they would loan some of their collection to the Museum – a win-win situation. At that point in time, the Museum did not have a truck for carrying art around, nor was there commercial companies available to do that as well. One summer when Barney was going to the Clark’s to pick up the art, he asked me to go with him in our small Opel station wagon. He wrapped and loaded paintings and sculpture in the back of the station wagon, and then he put a large blanket in my lap. He brought out the egg from the “Beginning of the World” and put in my lap covering it with the blanket. It was so like my father to say, “throw yourself over the egg”. It gives me pause to know that the fate of the “The Beginning of the World” was once in the hands of my parents, but such was life at the Dallas Museum of Art during my childhood. It was still a small institution at that point…..still a family affair and I spent many a summer working for my father and handling art that would be unimaginable today. But that’s the way it was back in those days and I could tell you a couple of stories from back then that would make a museum today shake in it’s boots.